After confessing all your sins say: I am sorry for all my sins. should love above all things. When the priest says: Give thanks to the Lord for He is good. You say: His mercy is forever. Have I remembered to pray to God every day in the morning, before and after meals and at night? Have I said God’s name in the wrong way without love and respect? If I am not sick, do I give God honor at Mass every Sunday and holy day? Do I disobey my parents or other grownups who take the place of my parents? Do I obey quickly? Have I been angry or mean to anyone? Have I taken good care of my body (eating good food, getting enough sleep)? Have I done anything hurtful to someone else’s body? Have I taken anything that belongs to someone else or have I been careless with things that belong to someone else? Have I been upset because someone is liked more than me? Have I been upset because someone has something that I do not have? 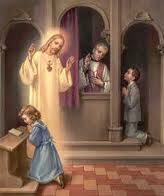 Telling Jesus our sins in the Sacrament of Reconciliation so that He will take them away. The ability to know the difference between right and wrong.